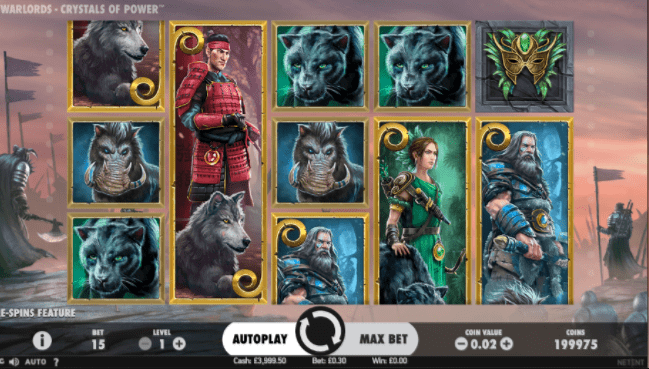 NetEnt has been developing video slots for over 20 years and has pioneered the development of some amazing online slot games throughout this period. Besides developing games, they’ve also collected a couple of awards for them. The development team strives for innovation and creativity, providing flexible digital casino solutions for a range of games companies. Today they serve over 170 of the world's most prominent casino operators, developing high-quality video slots globally. Players can always test play our slots games from NetEnt. 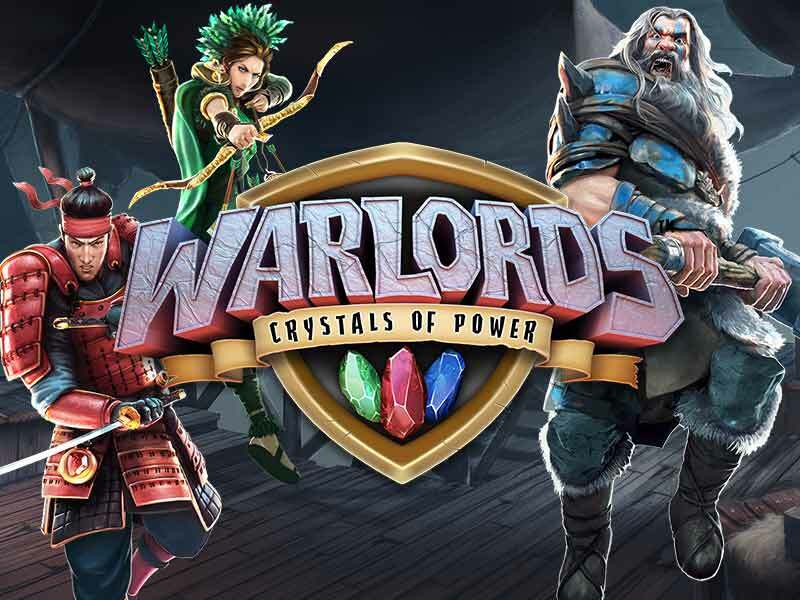 Warlord: Crystals of Power will transport you into a mysterious medieval and fantasy themed world. 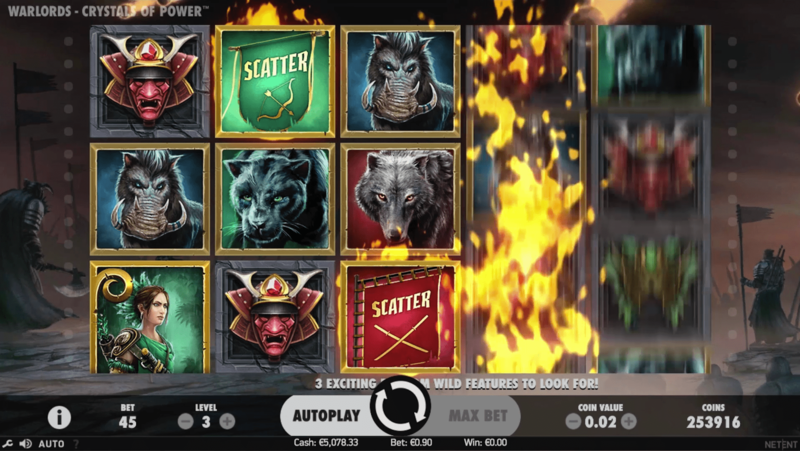 You will get to know this best-rated online slots three rulers: the barbarian, the priestess, and the samurai. All of them fight over land and treasures and soon you will become a witness of their epic battles. Spread over the 5 reels and 3 lines you will see the three rulers, their faithful and dangerous companions (wolf, panther, and warthog) and their beautiful masks enhanced with their own crystals of power. Each ruler has its own different coloured crystal of power; the barbarian is the owner of the blue crystal, the green crystal belongs to the priestess and the red crystal is the samurai’s treasure. You can find three different scatters belonging to each ruler and represented through a flag of their corresponding crystal colour and their weapon of choice. If you get 3 of the same scatters on a spin you activate the corresponding free spins feature. If you only get 2 of the same scatter you will trigger the last chance feature and you can either win up to 100 times your stake or an additional scatter activating the free spins feature. If you land different scatters on a spin you will enter the battle mode where all rulers will be fighting over their free spin feature. With active scatter remaining on the reels you will get a re-spin and for every new scatter you will be awarded extra re-spins. The three different free spins features are activated through the distinct scatters and each of them has their own unique modifier. The blue scatters will activate the barbarian free spins. You are awarded a minimum of 9 free spins and the reels will have the warthog as a high-value symbol and the other animal symbols. There will be a new scatter added that will grant you another 3 extra spins. You can win up to 600 times your stake with this feature. With the red scatters you will enter the samurais free spin feature. You will get 5 free spins and all the scatters are turned into sticky wilds increasing your chances to win up to 600 times your stake. 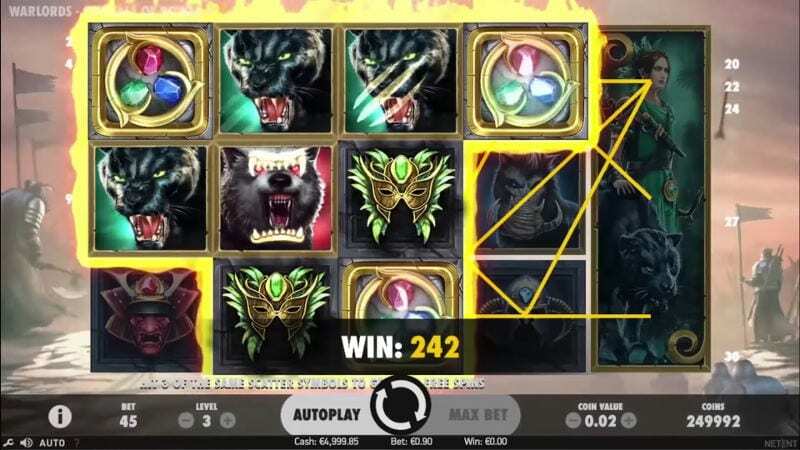 The green scatters will trigger the most lucrative free spins feature of the priestess. You are awarded 7 free spins and extra scatters are added to the reel that will increase the multiplier by 1x for each one that is visible on any line. You can win over 6666 times your stake in this feature. This beautiful video slot is all about the free spins turning it into a very lucrative online slot game, however, money can also be made across the base 30 pay lines. The highest value symbols are the Samurai and the wild, which is represented by the three crystals of power and can substitute everything except for the scatter. To take part in the adventure you need to bet anything between 15 pence and 150 pounds. There is also a random overlay wild feature in the base game making your chances of walking away with a big treasure even more likely. This feature can be triggered randomly and plays on a different reel set with no scatters. There is the barbarian hammer, giving you 4 wilds in the shape of a square on the reels 1 to 4. The priestess arrow, awarding you between 2 and 5 wilds on reels 1 to 5. And the samurai sword, giving you between 2 and 5 wilds on reels 1 to 4. This adventurous game will immerse you in the mysterious world of the three rulers battling over power. The high definition graphics will amaze you with its beauty and the animations will turn the game even more vivid. Combined with engaging sound effects this game turns into an epic video slot experience you do not want to miss out on. With the different and unique free spins feature this game can turn lucrative very quickly. To try a different game called Aquarium, please click here.